FIG. 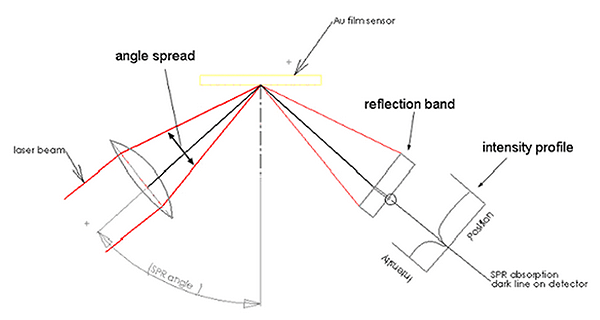 1 Principle of SPR detection in the mode of measuring the SPR angular shift. This profile is often used in a typical SPR experiment to indicate that the metal film (or the solution above the metal film) matches the SPR resonance condition, and that the apparatus is set up properly. However, the actual measurement of molecular adsorption kinetics is only related to the shift of the absorption (SPR) dip corresponding to the SPR angle change (Figure 2). One has to sacrifice the resolution of the measurement by acquiring the whole intensity profile curves and comparing them to find the shift of the dip (minimum). FIG. 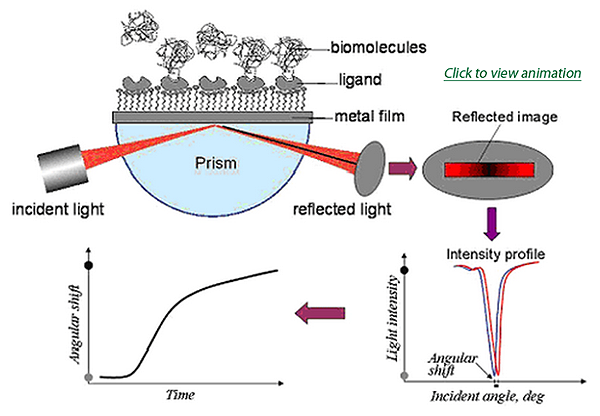 2 A light is beamed upon a metal film through a prism and the reflected beam image shows a dark line due to SPR. The intensity profile of the reflected beam exhibits a dip or minimal intensity at the resonance angle. An SPR experiment measures the position shift of the dip (the angle shift) upon molecular adsorption, and this shift represents the adsorption kinetics when plotted as a function of time. Biosensing Instrument Inc. uses a different approach to detect the SPR angle change by using a position-sensitive detector to detect the SPR absorption dip shift. Since this setup only measures the position shift of the dip, it offers a highly sensitive detection scheme to measure extremely small angle changes of the SPR. As long as the SPR angle resides inside the angle spread, the system delivers exceptionally high angular resolution in its measurement. Even though intensity profile is commonly used for demonstrating the proper alignment and the setup of an SPR system, it only offers a limited status check of a metal film at a single position. 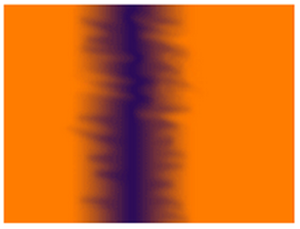 For a dual channel detection scheme, a single intensity profile check is not sufficient to ensure that the system is in proper SPR detection condition. One has to ensure that all the illuminated areas of the metal film are in good condition. BI-SPR instruments provide the user a simple but sufficient solution by projecting the SPR absorption dip onto a screen that can be visualized. By examining the quality of the dark line (Figures 3 through 5), one can ensure that all conditions of SPR are met and that a successful experiment can be conducted. FIG. 3 A good metal film gives a clean and straight SPR dark line in air (left) and solution (right). FIG. 4 A bad or contaminated film gives a fuzzy and indistinct dark line. FIG. 5 A trapped air bubble underneath the metal film sensor will break the dark line. However, at the drawn line, the dark line will still give a good intensity profile of SPR. As illustrated in Figure 3, a good metal film gives a well-defined, clean, and straight dark line. This guarantees a good intensity profile at any point along the dark line. Figures 4 and 5 demonstrate that a partially-contaminated metal film can still give a reasonable intensity profile of SPR at a given point. However, it will not lead to a reliable measurement, since the film quality is bad across a large area. Click here to download a PDF of this technical note.